GALION — Learning to give back to the community and help others has become a staple in the educational journey for students in the Galion City Schools district. 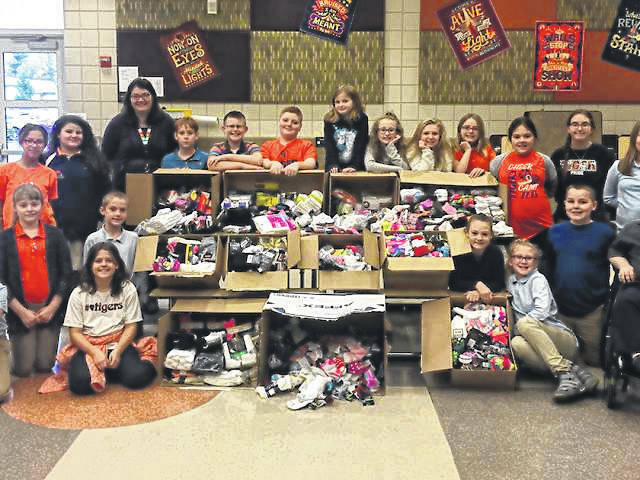 Galion Intermediate School fifth-grade teachers and students held their annual “Socktober” fundraiser for the fifth consecutive year and it was a tremendous success. The students collected 1,629 pairs of new socks, bringing their five-year total to more than 4,000 pairs of socks collected. The fifth-grade team, after reviewing the idea from YouTube sensation Kid President, decided to launch the “Socktober” fundraiser at the Intermediate School during the 2014-2015 school year. In the three-minute video, Kid President challenged Internet users to change the world. The fifth-grade students and teachers expanded the fundraiser last year to include all the classes at the Galion Intermediate School. The top three classes collecting socks included: 3rd grade – Mrs. Kiger’s homeroom (74 pairs of socks); 4th grade – Mrs. Shipley’s homeroom (105 pairs of socks); 5th grade – Ms. Prince’s homeroom (683 pairs of socks). For more information about the “Socktober” fundraiser, please contact Paula Prince at 419-468-3676 or email prince.paula@galionschools.org.